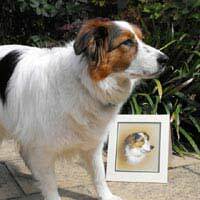 When painted by a professional artist, pet portraits can make a wonderful gift for the animal-lovers in our lives. We use the term ‘pet’ here rather loosely; as you’ll discover when you read about some rather unusual animals artist Michelle Diprose has painted! “I’ve always painted, ever since I was a kid,” Michelle told me. She studied as a Wildlife Illustrator at Carmarthen Art College and is a keen wildlife photographer. Her first commercial venture as an artist was painting greetings cards-each one an original. That was during the last recession though, and in that period of financial difficulty pet portraits were considered to be a luxury item; so Michelle had to rethink her future. As a professional artist, though, Michelle uses oils when specifically requested by a client. She also does charcoal and pencil sketches; but is not a fan of pastels! Dogs, Horses, Cats…and Water Buffalo! Trips around the UK provide Michelle with opportunities to photograph wild deer, dolphins and all sorts of wildlife. Her most unusual subjects, however, include ostriches, goats and water buffaloes. I asked Michelle what tips she could give to any aspiring pet and wildlife artists. “Have a proper day job too!” she laughed.